It's Halloween, and time for scaring family and friends. Do you remember the monster under the bed? When I was a child, I knew it was a man-eating lion. He'd disappear when someone walked into the room, but stick an arm or leg over the edge and he'd snap them off. What about the creepy house just down the street, the one you passed by every day on the way to school? Did you imagine someone watching you from the broken window? Remember the cornfield that went on for miles and miles. Did you ever run through it and get lost among the dying stalks? Remember the panic that set in and the laughter of your cousin, when you finally emerged with the stain of tears on your face certain that something had been hunting you. Or maybe it was more benign, a graveyard that looked serene during the day, but at night unexplained lights would move among the gravestones and give you the chills or worse. Tell us about the horror that stalked you in the night. Write about it for this month's challenge and turn those childhood fears in a scare-fest like no other. For this challenge, share a childhood fright that might or did turn into an adult fear, real or imagined. b. share a photograph or painting that captures the horror you've felt. 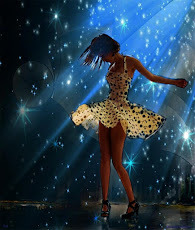 Open to all genres - Fiction works can be - Adult, YA, MG. All entries maximum 1,000 words. "How to Write Scary" by Annalisa Crawford, guest judge for WEP's Halloween challenge! The subject today is "How to Write Scary." Author and the guest judge for this year's Halloween challenge, Annalisa Crawford is here to share some of her secrets just in time for the WEP Halloween challenge. In just seven days the post for sign up will go live. Many thanks to Yolanda and Denise for inviting me here today. Although, when I was asked to write a post on ‘how to write scary’, I wondered whether I could. I don’t think I know how to write scary. When I write, I never know exactly what genre is going to appear. Sometimes they just happen to be scary. I do most of my writing at home, in front of a very large window. Yes, sometimes people do pass by when I’m in the middle of one of these moments. Yes, people do look in the window and give me some very strange looks. Although, to be fair, they shouldn’t be looking into my living room in the first place! So, how do you write a scary story? Don’t try to be scary! I once watched The Others. It’s rated 12 in the UK (not sure about rest of the world equivalent), so it’s not actually a scary film, but I was on edge watching it. It’s understated, muted and you can feel the tension in every scene – even in scenes that aren’t inherently scary. Avoid explaining everything. 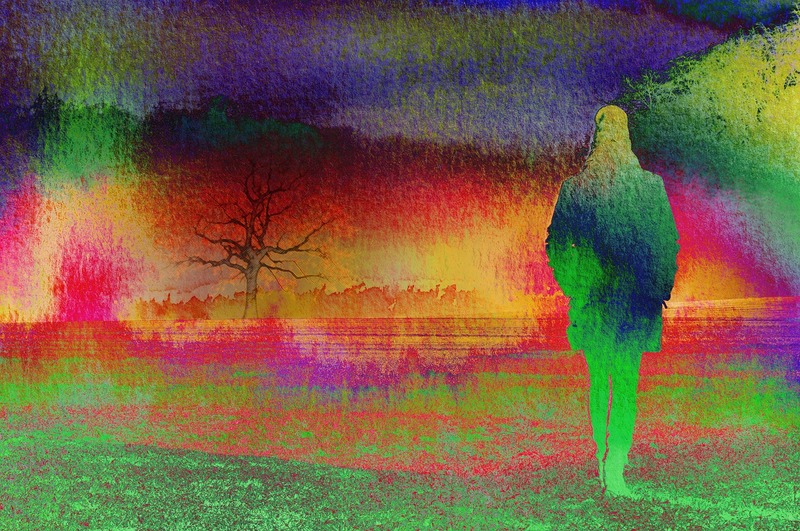 The scariest things in daily life are the things you don’t understand – even the simple inexplicable noise from the next room can alarm you, especially if you can’t find the cause. However, you as the writer need to be absolutely sure what’s happening. This isn’t a scary story example, however, I once wrote a short story where the main character split in two – but I didn’t explain whether this was a physical, spiritual or figurative split. I know, but I’m not telling! Think about the actual words you are using. Read your story out loud to highlight where you might be going astray. a. Use a thesaurus. Some writing advice advocates using simple words that people understand so the story flows, but sometimes a slightly unfamiliar word can work to unsettle the reader. This is a scary story you’re writing, remember – you don’t want your reader to be comfortable. b. Use short sentences. I love to start a paragraph with a long, ambling sentence that flows and leads the reader into a lull from the action. And then a shorter one, to heighten the tension. Shorter, to incite anxiety. c. Use repetition. You have to use this technique sparingly, and know when it’s too much. Reading aloud will definitely help here. Repetition of a word within the same paragraph, or the same sentence from the beginning of the story repeated every so often throughout, can bring your reader back to the main issue. 5. Once you get to the end of your story, go back and add in foreshadowing. Again, this needs to be subtle, just a word or two that hints towards something later on. What tips can you share? Do you use some of these techniques already? Thank you Annalisa, for sharing your knowledge and for judging our efforts. Annalisa Crawford lives in Cornwall UK, with a good supply of moorland and beaches to keep her inspired. She lives with her husband, two sons, a dog and a cat. 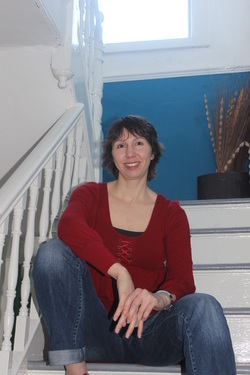 She writes dark contemporary, character-driven stories, with a hint of the paranormal. 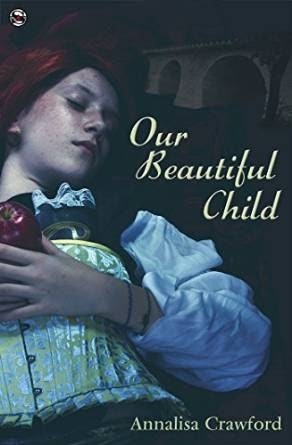 She has been winning competitions and publishing short stories in small press journals for many years, and is the author of Cat & The Dreamer, That Sadie Thing and Our Beautiful Child. 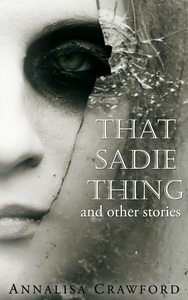 That Sadie Thing and other stories is an intense and emotional journey through the relationships that define our lives. Welcome to the WEP's For Your Information Segment. You may be at the beginning of your writer's journey or well along the road. A vexing question that pops up again and again is 'what about copyright?' So, today we have Ellen M Kozak an attorney in copyright, publishing, entertainment and media law from Milwaukee, Wisconsin, to explain exactly How You "Get" a Copyright. Actually, you don’t have to do anything to “get” a copyright in your work. You have it as soon as your work meets two criteria: it must be fixed in a tangible medium of expression and it must be original. Although there is no copyright protection for facts or for an idea, the way in which you express those facts or ideas can be copyrighted. Assuming that your work is long enough (and a haiku is long enough, although a name or short phrase is not), the next step is fixation. In order to be protected by U.S. copyright law, a work can be fixed in any medium from which it can be read back visually or by use of an electronic or mechanical device. That allows for works that you have scribbled, dictated into your cell phone, or typed into your computer. But your work needs to be capable of being read back, so if you’re using odd or obsolete technology, it’s often best to have a paper copy as well. Originality means, essentially, that you thought it up yourself, without copying it from anyone else. Originality is found in the way you express an idea, so a mere alphabetical list, no matter how long you spent compiling it, is not likely to qualify unless you were also selective in creating it. You also cannot protect a mere list of ingredients for a recipe with a copyright. However, if you attach descriptions to the things on that list, and those descriptions are in your own words - or if the directions for your recipe include anecdotes about your experiences in making the dish-- then the way you have expressed those facts usually passes the threshold for originality. No search is necessary to determine if a work is original, and it is altogether possible that two people could create similar works without ever seeing each other’s work. 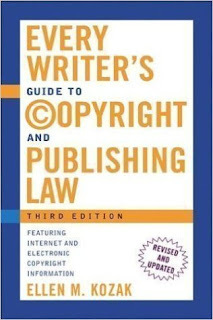 When that happens, the law considers both works to be copyrightable and each author owns the copyright in his or her own work - in the work as a whole, and in every part of it. When a work is created by more than one person, even if the contributions are not equal, the work may be a “joint work.” All people who contribute copyrightable elements to a joint work are co-owners of the entire copyright in the joint work, and any one of them can exploit it without the consent of the others, so long as any proceeds are shared. This makes it important to have agreements with all people contributing creative content to a work - agreements that specify what rights, if any, each of the participants will have in it. 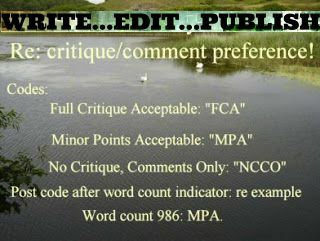 Assuming your story, song, painting, photograph, or other original work passes these tests - that it is original, that it is fixed, that it is either solely your creation or that you have made appropriate agreements with other participants concerning copyright ownership-- you don’t have to do anything more to “get” the copyright. Acts like registering your copyright or putting a copyright notice on the work can make your rights more enforceable, but they are not required for copyright ownership, because the copyright exists whether these things are done or not. Thank you Ellen, we appreciate your expertise. Folks, if you have questions, please leave a comment. We will pass them on to Ellen, if she can answer them she will. That is it folks, as simple as that. "The minute you preserve the work in some form that can be read back, you own the copyright in it; basically, copyright ownership is that simple." Understand this "You cannot lose a copyright unless you sign it away! U. S. Copyright further states that it must be in writing and signed by the copyright owner." Ellen's article deals with US law which is federal and (basically) the same throughout the United States. Ellen tells us that the US and most other countries - while they usually have their own national copyright laws - are signatory to the Berne Convention (a multi-national treaty) which similarly reserves copyright to the creator of a work. The Berne Convention was first signed at Berne, Switzerland, on September 9, 1886. The United States became a member of the community of nations that have signed this treaty as of March 1, 1989. What this means is that if you are a writer or author who lives in one of the 164 countries that are part of the convention, you are covered under this copyright law. Countries include the United States, Canada, the United Kingdom, Australia, and the European Union. To mark your work as copyright all you need is the word Copyright or the symbol © (just type a parenthesis (then a C and then a closing parenthesis – do not put a space between the symbols. Or you'll see this ( C ) without the spaces you have this ©. Next is the date in which the work was first published, and then the name of the author. For instance, I publish all my work online with the following. If you are looking for legal help, please seek the laws of the country where you reside or publish. Neither Denise nor I are attorneys and cannot offer legal advice. Our only goal in the publication of these facts was to give information and to aid the participants who voluntarily share their work with the WEP. You retain the right to your creation; we only offer a place to share and receive feedback. The above link provides several copyright articles from Writers Knowledge Base, depending what tack you are taking on the topic. Writer's Knowledge BaseThe Writers Knowledge Base is a very useful resource. Here you can find the best articles covering just about anything you want to know about writing/publishing your book -how to write blurbs, synopses, elevator pitches, taglines...and, well, everything a writer needs to know. Halloween is coming friends! Get creative! Share the WEP's FYI Segment! We asked the winner of the Spectacular Settings challenge to share her writing journey with us today. 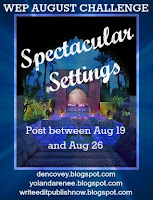 It is with great joy we welcome Elephant's Child to the WEP blog as our first winner guest poster. 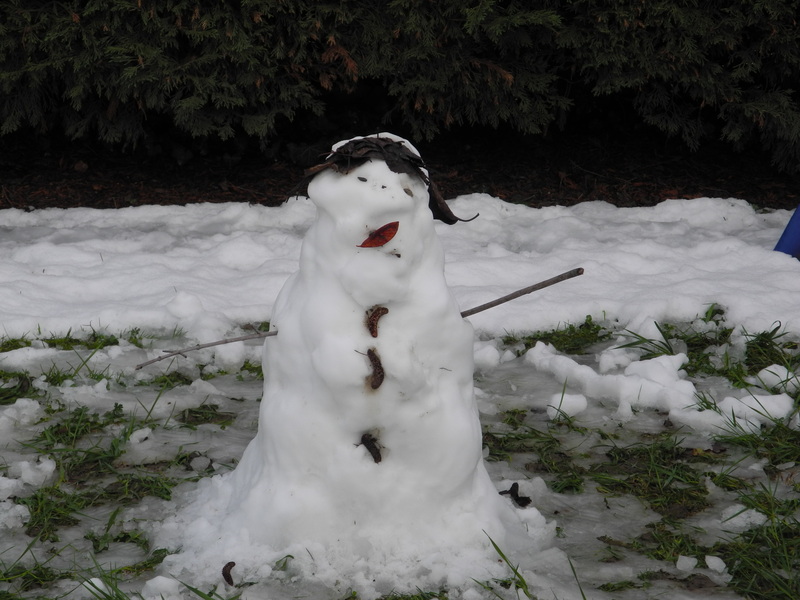 Over fifty years ago I was told firmly that I didn't have a creative bone in my body. I have carried that label ever since. Sometimes I barely noticed it, and at other times it weighed heavy. As a consolation prize I was assured that everyone has a special talent - and mine would emerge. So I waited for that talent to appear. And waited some more. And the years went by. A few years ago I had an epiphany. I am an appreciator. I am a beauty addict and find it almost everywhere. In nature, and in many man-made creations. Books are a prime favourite and I guzzle them. Across genres. Quirkiness and whimsy too. Painting, pottery, sculpture, architecture, crafts... A little later I realised that not only am I am appreciator, I like to share the joy and the magic. 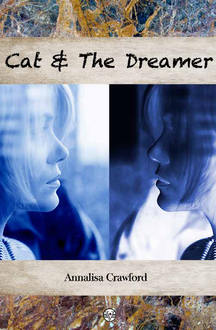 When I found the blogosphere about four and a half years ago it was like coming home. I was invited into people's lives, educated and entertained. I laughed with other bloggers, I wept with and for them. I wrote about some of the things which move me, and took photographs to share the wonder. And made friends. Good friends, even though I will probably never meet most of them. As I explored my vastly expanded world I was introduced to a writing meme 'Words for Wednesday'. Each week a selection of words, a phrase, or an image go up and we are encouraged to play. Some people create incredible stories. I content myself with a paragraph or two. And marvel at the very different things triggered by the same prompt. When I came across Write Edit Publish I knew I would be back to revel in other people's creativity. Some gentle encouragement pushed me out of my comfort zone. No quick paragraph, but a considered piece. Something I have never done. When I put my entry up, it was with intense trepidation. I was awed at the creativity and beauty of the other contributions I read, and felt out-classed. When very generous comments started to appear the welcoming and supportive attitude was so very welcome. AND LOOK WHAT HAPPENED!!! I won!!! Surprise doesn't begin to cover it. Shock. Disbelief. It is too soon to say that I can (finally) discard that label I have dragged though life, but its shackles are looser than they were. I am so very grateful that Denise and Yolanda set this challenge up - and for the support and encouragement that everyone has provided. I love this diverse, rich, exciting community. Thank you EC. We are humbled by your humility. Thank you so much for sharing with us today! If you haven't read Elephant's Child's poetic entry, Memories. Magic. Mystery. please click here for a visceral treat. Stay tuned everybody. Next Wednesday we present a post on Copyright. Please join us. And keep your creative juices running. Our October Halloween challenge will be here before you know it. 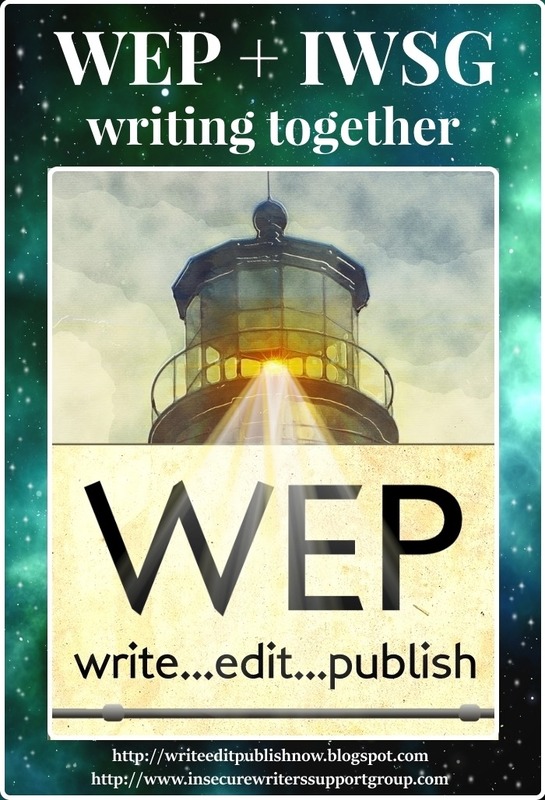 From poems to flash fiction, from photographs to original artwork, from creative fiction to travel essays and a playscript, WEP entries in the Spectacular Settings challenge were an inspiration to all. Your entries transported us to other lands, to other times, which of course was the underlying motivation for a settings theme. Part A - share a Spectacular Setting which stopped your heart. The shared settings were breathtaking. 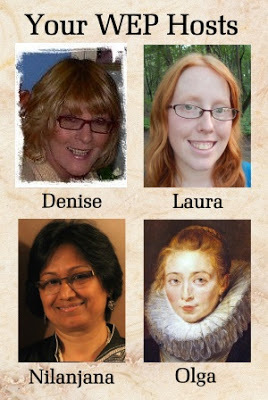 From favorite poems, book extracts to fantastic photos, WEP participants took us on a creative journey. Many famous authors and poets were often acknowledged by commenters as their own favourites, while others were happy to be introduced to a new writer or artist they intend to check out. D.G. Hudson of Rainforest Writing took us to the streets of Montmartre in Paris. 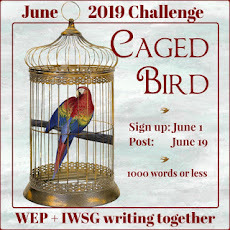 We had entries penned especially for the challenge or the perfect excerpt taken from a WIP. Through these shared, original pieces which highlighted setting, we were left open mouthed at the sheer talent indicated by the quality of the entries in prose or images. We had Damyanti at Daily [W]rite sharing an extract from her WIP, currently titled Underneath the Skin. Michael E Dellert from Adventures in Indie Publishing shared a scene from his WIP, The Hills of the Cailech. Who will forget '...a child's burnt stocking lying in the mud.' Guilie Castillo at Quiet Laughter shared a short passage from her published novel, The Miracle of Small Things set in her adopted island home of Curacao. Debbie from The Doglady' Den shared her love story of Greece with fantastic photographs, beautifully presented. Nilanjana Bose at Madly-in-Verse's contribution, Roadblock, transported us to the Himalayas. Kiran Acharya of The sea and me gave us The Ruins of Doddakudla enchanting us! 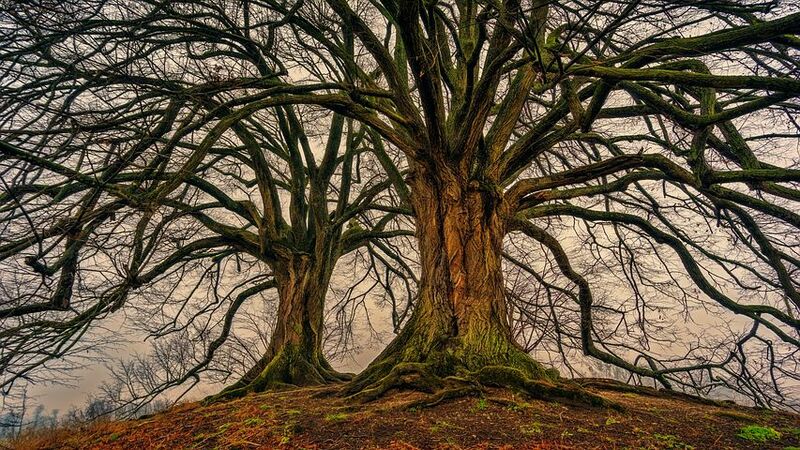 Rasma Raisters at Nothing but Poetry captured our imagination with her photograph and poem Golden Birches. Deborah Drucker of Notes Tied On The Sagebrush gave us The Journal is discovered a time travel and shape shifting fantasy full of promise. Sally Stackhouse of Sally's Scribbles introduced us to Molly and her young son, in a poignant flash called The Beach. And that's just a small sample. If you haven't had a mention it's not because we didn't love your entry, it's just the sheer number prevents us from doing a complete wrap up of all posts. If you haven't read any/all of these entries, please treat yourself! That's why we have Direct Links. Reading/commenting on others' work is a core belief of WEP and can and will be taken into account in the final judging if a decision can't be reached any other way. Now, I'm sure you'll understand the torture we piled upon torture when we tried to whittle down 44 entries to just 3 winners! 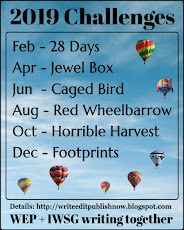 Yolanda and I struggled with this, and turned over 7 entries to our guest judge for this challenge, Donna Hole. Donna was a previous co-host and knows what to look for--entries that encapsulate the challenge, in this case, setting, entries that are error-free (or very nearly so), entries that have followed the guidelines (mostly), but at the end of the day, the entry must make our hearts sing. 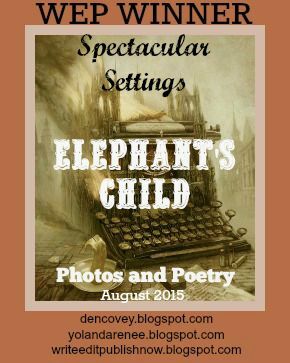 The Winner of WEP Spectacular Settings August 2015 challenge who takes home an Amazon Gift Card to the value of $10 is: ELEPHANT'S CHILD! Elephants's Child's entry consisted of amazing photographs accompanied by a poem, Memories. Magic. Mystery. The animate mood and imagery of the poem were captured at a dancing horse show in Australia. The movement and pace of the poem matched the picture, both evocative. So, congratulations EC! 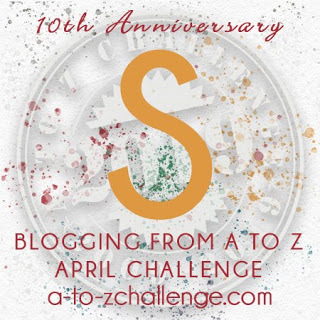 Please take the badge below and share it on your blog, linking to your excellent entry. Your Amazon Gift card will wing its way to you shortly! 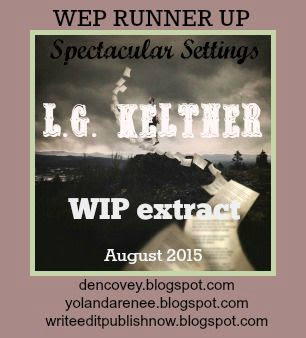 Next, we chose LG Keltner of Writing off the Edge for her extract from her untitled WIP. Her awesome descriptions and vivid sense of both history and the present earned her second place on the winner's podium. So, many congratulations LG, please accept this Runner-Up badge from WEP and display it on your blog, linking to your entry. Then, for the Encouragement Award, we chose Samantha Redstreake Geary who shared a beautiful, magical place in her entry, Weight of Wonder. Awesome descriptions, and using the trees as Dryads gave personality to the setting. 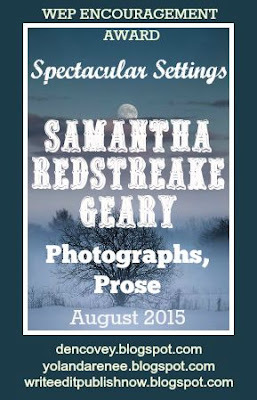 So, many congratulations Writerly Sam, please accept this Runner-Up badge from WEP and display it on your blog, linking to your entry. Honourable mentions go to those who were moved up and down the line as we chose the final 3. They are Robyn Campbell: what a beautiful poet. Vivid imagery in such a concise piece. Then Kate McManus: awesome travel article. we certainly wanted to visit, even in the rain. Michael DiGesu: yes, certainly a favorite. Loved the poetic imagery and who can forget that photo taken by Michael of the pink flamingos! And finally Michelle Wallace, with her edgy experimental flash on the South African beachfront. Now! Another fun part! Each WEP challenge we will have a lucky door prize! With the help of random.org, the August winner is: Laura Clipson! Congrats Laura! You have won a $5 Amazon Gift card which will wing its way to you shortly! Now we want to hear about your WEP experience. Please take the time to comment and congratulate the winners and tell us about your experience. There is a poll in the right-hand sidebar. We would love for you to fill it out so we can make the WEP experience better next time! We have had a debrief and have come up with ways to make it more user friendly in October. We hope you're already thinking about your Halloween post! There will only be one part to this post--so go scare us!! Please visit us next week when we'll be guest posting the winner, Elephant's Child.